Our business plan. Simply to be the best motorcycle rental company in New Zealand. We will achieve this through offering modern and reliable bikes with a level of service second to none. We are happy to assist with any questions you may have about touring New Zealand and try to make your motorcycle rental experience as easy as possible. We can arrange airport transfers before and after your tour. We also appreciate that you have traveled a long way to get to New Zealand and may arrive tired and jet lagged. We are happy to arrange accommodation for you on your first night. Maraetai is a very beautiful location and we have some great accommodation facilities near by. Staying in Maraetai for your first night will allow you to not only enjoy this special location, but pick up the bike on the day of your arrival so you can familiarize yourself with the bike, pack the motorcycle at your leisure and be ready to start your tour the next day. Please don't hesitate to contact us to ask any questions you may have about touring by motorbike in New Zealand or about the bikes we have to offer. Auckland Motorbike Hire is located 30 minutes drive from Auckland International Airport in the beautiful coastal suburb of Maraetai. Maraetai Is A Small Seaside Community Located On The Pohutukawa Coast. On Picking Up Your Bike The First Roads You Will Encounter Are Quiet Country Or Coastal Roads Free Of City Traffic Congestion Making The Start Of Your Journey Relaxing And Enjoyable. This is an ideal place to start your New Zealand motorcycle tour. Once leaving our premises you are immediately riding a beautiful coastal road free of city traffic. This is popular motorcycle route with Auckland motorcyclists as it is the start of the scenic route that will take you to the Coromandel Peninsula - a must visit destination no matter how long your stay is! Getting to us is easy. If you are staying in the central city there is a ferry service leaving from the Downtown Ferry Terminal that brings you to Pine Harbour (week days only), an enjoyable 30 minute ferry ride that follows Auckland's eastern shoreline. Once at Pine Harbour we will pick you up and bring you to our home base. From Auckland airport I can arrange a transfer to bring you directly to pick up the motorcycle. Please contact us as we are happy to help arrange your accommodation needs for when you arrive. Hello, my name is Randal Brown and I am the owner/operator of Auckland Motorbike Hire. 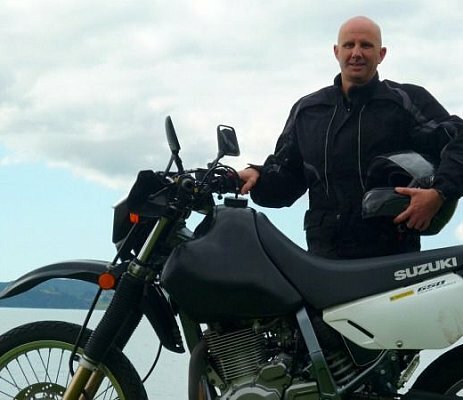 I have been a keen motorcycling enthusiast for 25 years and combine my passion for motorbikes and New Zealand to offer you a chance to experience a motorcycle tour of a lifetime. We do this by providing a fleet of affordable, well maintained modern and safe motorcycles that are ideal for the conditions that New Zealand provides. Along with a level of service that is friendly and helpful, we aim to make your motorbike hire in New Zealand as easy as possible. We base the motorcycle pick-up and drop-off at our home in Maraetai. We do this because Maraetai is a great place to start your motorbike tour. You are immediately onto open roads free of city traffic and congestion, making for a relaxed and enjoyable start - especially if you are used to riding on the right hand side of the road.